Forty million Americans indulged in a national obsession in 1930: they eagerly tuned in Amos 'n' Andy, the nightly radio serial in which a pair of white actors portrayed the adventures of two southern black men making a new life in a northern city. Fans insisted that the unfolding story of Amos, Andy, the Kingfish, Ruby, and their neighbors be piped into restaurants, movie theaters, and hotel lobbies: Amos 'n' Andy impressions and theme parties were the rage. Meanwhile, African Americans argued passionately among themselves about the program. While one black newspaper gathered hundreds of thousands of signatures demanding that the show be banned, another chose Amos 'n' Andy's white stars as guests of honor at a parade and picnic for the black children of Chicago. Today the name Amos 'n' Andy survives in the American language mainly as a glib synonym for racist stereotyping. But that verdict cannot explain why Americans both black and white made Amos 'n' Andy the most popular radio show of all time. Melvin Patrick Ely explores the enormous appeal of the famed duo as he narrates a fascinating tale of the shifting and ambiguous color line in twentieth-century America. He shows how Freeman Gosden and Charles Correll, Amos 'n' Andy's creators, mixed old-fashioned blackface minstrel traditions with vivid, sympathetic characters and surprising innovations. While listeners could find ample reinforcement for their prejudices in the show, white liberals and many African Americans saw it as a warm, humane portrait of black life. Millions became emotionally involved in the lives of Amos, Andy, and their friends in ways that transcended race; scores of white parents even named their twin sons after Amos and Andy. Ely recreates the engaging, sometimes disturbing genius of Amos 'n' Andy during the heyday of radio and follows the transformation from white actors to black when the series moved to television. A rising tide of African American consciousness led to new protests, but these did not prevent a new generation of black and white Americans from watching Amos 'n' Andy in TV syndication even as the Civil Rights Movement filled the small screen with a very different set of black images. Until Melvin Ely first published this book in 1991, Americans had preferred to ignore the hard questions about race that this classic American radio and television series raises. 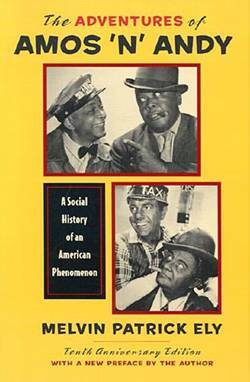 From the beginning, whites took comfort from Amos 'n' Andy's popularity among black listeners, and they were quick to insist that America's favorite radio show--and, by implication, the nation as a whole--dealt kindly with blacks. Ely's Adventures of Amos 'n' Andy traces the history of a society less and less comfortable defending the most obvious flaw in our democratic order--the color line--yet still unwilling to erase it once and for all. University of Virginia Press: More information about the book. Amazon.com: Order the book online. A stunningly objective look at the history of the program and how it affected, and was affected by, the culture at large. . . . Remarkable. [A] sensitive and scholarly work. An engrossing, perhaps definitive, account of one of the most fascinating episodes in popular entertainment. A brilliant job of sorting out what is in many ways a hellishly complex story . . . . Exemplary scholarship and well-reasoned eloquence. A rare study of popular culture that is also valid as serious history. Painfully funny . . . ironic.